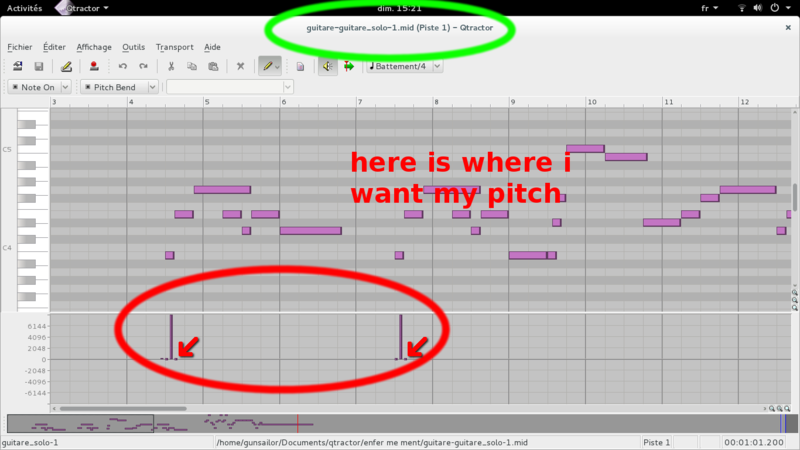 i'v tried to pitch bend ( as i told above ) a single note of my song in qtractor 0.6.
it didn't work the first time. next, suddenly, it worked without me to know what happened. i next download qtractor 0.8 ( the new one), but there is the same problem. is anyone having an idea ? well, i gave to few an information to start with. how are you entering pitch-bend events into your song? are you recording onto a new MIDI track or clip? are you playing over already existing material and of course tweking the pitch-bend wheel or stick on a MIDI keyboard controller ? are you entering discrete pitch-bend events on the MIDI clip editor (piano-roll) ? which MIDI instrument, plugin or external, is on rendering? and whatever else? i'm entering discrete pitch-bend events on the MIDI clip editor (piano-roll). furthermore, sounds like the original pitch of the notes is incorrect. or maybe i've worked too lot. what's the MIDI instruments, plugins or external, that you're using? now, a couple of screenshots would be most welcome for help. also, you can save your session (song) as a .qtz (zip archive format) and attach it here for evidence. it's right for your first question. i'm using fluidsynth as plugin. aha. i see your trouble. aha. i see your trouble. you seem to have zero pich-bend events right after the ones you wish have effect. the pitch bend is relative to the note just above. if i hadn't put a pitch bend to zero at the next note, it would have been pitched up too... and my whole song would have been higher at this point. i just want to pitch bend this only one note at a time. i've done the same for my bass and it works for it. why it doesn't work for my guitar? that's the real question. have you tried my session ? re. no no and no. -- pitch-bend is a channel wide controller message that applies to all and current playing notes on the designated MIDI channel. qtractor, fluidsynth, and most if not all other MIDI instruments out there complies to this standard. sorry again. so how can it work for my bass ? it works fine for only one instrument !!!! how can you explain this ? i've understood that pitching involves the whole song. that's why i've put the pitch bend to 0 before and after pitching !! so that only the note i want would pitch !!! it works for the bass part because there is no zero pitch-bend event after the upward pitch-bend--only on the guitar part you have one before and after the top pitching. you must realize that a zero pitch-bend right after any other just makes the former (almost) to a nil effect. iow. you may hardly hear the pitch-bending if any at all (it depends, on tempo and the synth slew rate reactivity, whatever). "it works for the bass part because there is no zero pitch-bend event after the upward pitch-bend--only on the guitar part you have one before and after the top pitching." on the guitar as well as on the bass, i've put zero pitch bend events before and after the key note. "you must realize that a zero pitch-bend right after any other just makes the former (almost) to a nil effect." this is the aim of putting the zero pitch bend after. do you realize this ??? i would like to speak to someone who know his subject.